At the EAA annual ball Malcolm Fraser Architects won the annual Silver Medal for Architecture. The winning scheme was the Drum in Bo’ness developed with Stewart Milne Housing and Horner McLellan Landscape architects after a limited design competition. The 28 houses are grouped around intimate courtyards with magnificent views over the Firth of Forth. They represent an attempt to improve the design quality with volume housing builders and has, as such, been very successful. Maryfield housing development is situated in the town of Bo’ness, a small postindustrial town in the East of Scotland. 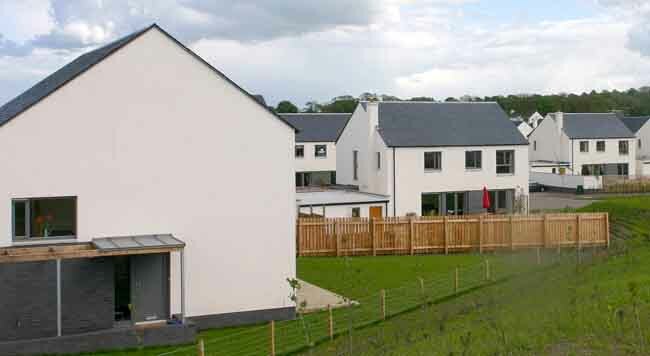 Maryfield is the third phase in a multi-phase mixed development of housing, parks, business park and future cemetery. The masterplan site is within the urban limit and is particularly sensitive. It adjoins the greenbelt, the site of an ancient monument (a Roman marching camp), Kinningars Park and the conservation area of Muirhouses. The site has unusual topography in a drumlin and ridge formation with a steep north-facing slope. The whole site area has fantastic views over parkland and countryside with aspect to the Firth of Forth and the Ochil Hills. As such, it was landowner Grange Estates’ wish that any development should be sympathetic to this environment, and with their personal commitment to the quality of their legacy, have attempted to provide an aid to achieving ‘added value architectural design’, both in terms of encouragement (a limited design competition) and finance (the acceptance of low bids). An urban design framework was produced at each stage by Cadell 2, (architects and urban designers). These documents set out clear parameters for the development of the site by the selected housebuilder, architect and landscape team. Malcolm Fraser Architects’ winning proposal, evolved for, and with, Stewart Milne Homes (and in collaboration with landscape architects Horner & Maclennan), is to develop a simple, affordable house type that offers the house-buying public basic, considered and modern planning. The scheme attempted to redress the balance from a ‘bells and whistles’ approach to one that focuses on some of the best aspects of 60s and 70s design and suburban estate planning. The site is a happy one: suburban, in the sense that it is part of the low-rise surround to an established centre, but garden-suburb in its integration with the serpentine park that Grange Estate has created. The phase 3 site is planned to maximise connections and views out to this park and the surrounding countryside; but is also planned round shared squares and landscaping, the whole integrated by pathways. placed to define a separate, hard-landscaped courtyard (for washing, bicycles, etc) and a carmending space in front, the whole defined and linked by a tartan grid of pergolas and paths. A combination of garden walls, hedges and screens are arranged to create privacy and to shelter the outdoor spaces from the wind. 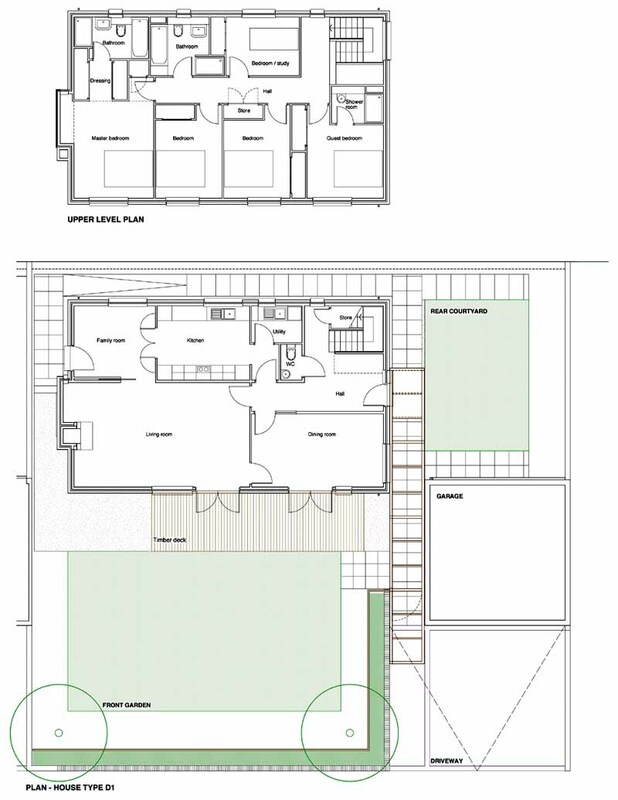 The site plan with its bigger squares, and the house plan with its simple “homesteading” layout responsive to the sun, were then integrated to generate the completed development. There are 28 sizable, four to five bedroom houses of varying configuration. The buildings have a simple and clear form. The house plan is simply organised around solar orientation and views. Utility rooms, stair and bathrooms are grouped around a service zone (set typically to the north), while the main public rooms are generally south facing, or have an east-west orientation. Focus has been placed on the relationship between internal spaces, the garden and inner courtyards and on how to create interconnecting, modern living spaces. Main living rooms can be opened directly to the garden through big glazed doors. The housing units are timber framed, although much of the detailing is non-standard. The simple approach allowed a cost effective solution with money saved on reducing complexity of form, used on large openings and better finishes. The palette of materials and attitude to detailing is deliberately restrained and typically ties in with local vernacular traditions. In addition, some continuity has been maintained with the earlier phases. Houses are smooth rendered with blue engineering brick base courses, timber windows, cedar doors and bay window and natural slate on the roofs. Untreated larch on pergolas and garden fences will weather and age with the maturing landscaping. The overall construction cost of the project, which was privately funded, was £5.1m.